Kokum, the traditional fruit of the Western Ghats, is an indigenous component of many traditional kokani recipes. 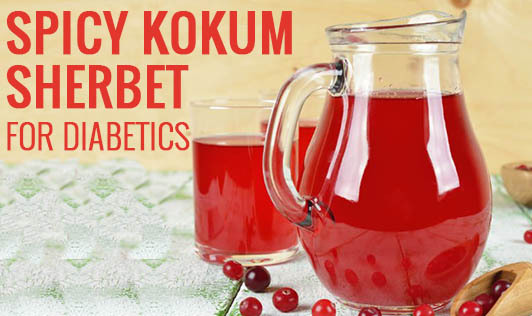 Kokum is good for digestive problems like acidity, flatulence, indigestion, and constipation. It is also carries anthelmintic properties and stimulates appetite. All these qualities of kokum make spicy kokum sherbet an excellent drink to have, both before and after a meal! It is also a great drink to have during the summer, as it produces a cooling effect on the body and prevents dehydration. • Wash and soak the kokum peels for 3 to 4 hours. • Add the green chilies and kokum in a blender and grind until smooth. • Pour the puree into a bowl and add 4 cups of water to it. • Add the sugar substitute and stir well. • Finely chop the coriander and mix it in. • Finally, add the salt, stir well, and refrigerate for 2 to 3 hours. • To serve, strain the sherbet into 4 individual glasses and garnish with coriander.